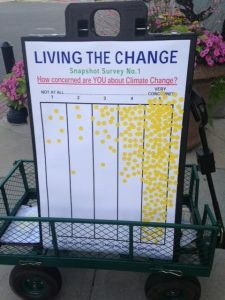 In order to broaden and include more of us in the conversation about Climate Change we conducted three Snapshot Surveys during the Third Thursday street-fairs in Pittsfield. Climate change is a topic many of us find overwhelming and at the same time elusive. It can make us feel helpless, guilty or angry. In July: How concerned are you about climate change? People responded to the survey by placing a sticky dot on columns from 1 (not concerned at all) to 5 (very concerned). Of a total of 352 responses, 238 fell into the last column – very concerned. Column 4 (quite concerned) followed with 69 responses. 13 people said they were not at all concerned, with the remainder falling into column 2 and 3. You can see the result on the picture above. In August: What do you feel would be the best way to address climate change? The answers to choose from in this survey were: Alternative energy: 107 votes. Insulating homes: 22 votes. Electric cars/ alternative transportation: 45 votes. Taxing carbon: 22 votes. Planting trees and agriculture: 52 votes. We also had a column in which people could write their own ideas or comments. Here, by far the most common response was ‘population control’. In September: How much do you think your life/ that of your children will be affected by climate change? Most people answered that they felt their lives were going to be impacted significantly, those of their children even more so. Here, too, people could write their own responses on stickies in answer to the question how climate change would most likely affect their lives. The most common answers were: Changing weather/ droughts-storms/ crazy weather/ flooding/ weather drought/ storms/hurricanes/ food and crop problems/ air quality/ everything/ affects how we live/ life threatening. More important even than this informative data, the survey gave us an opportunity to speak with a wide variety of people: from a young man working with reforestation in Haiti, to a woman unaware of the flooding in Louisiana and the wildfires in California, to another man certain that climate change is not human-caused but who still favors energy conservation and clean energy, to someone supporting second-generation nuclear energy. The event left us hopeful that a vast majority of us is in support of measures to protect our planet and all of its life-forms from the worst of climate change. Now we have to let politicians know. Survey Results from June 2016: How concerned are you about climate change?